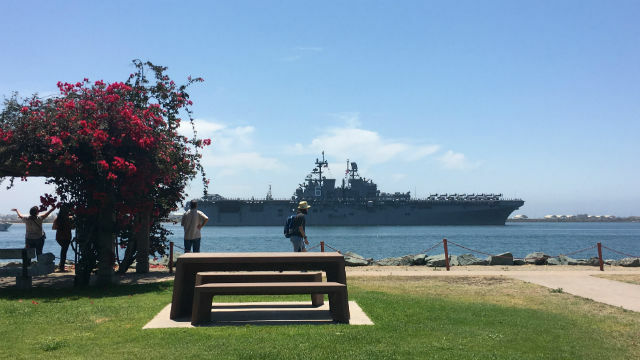 Sailors and Marines in the USS America Amphibious Ready Group and 15th Marine Expeditionary Unit left San Diego Friday for a regularly scheduled deployment. The naval force is comprised of the amphibious assault ship USS America, amphibious transport dock USS San Diego and amphibious dock landing ship USS Pearl Harbor. During the deployment, they’ll operate with embarked forces of the Camp Pendleton-based 15th MEU, the “Wildcards” of Coronado-based Helicopter Sea Combat Squadron 23, and various other units. The Navy said the three ships have been at sea for much of the last six months preparing for the routine deployment. Typically two or three amphibious ready groups are forward deployed at all times in the Pacific Ocean and near the Middle East. A group can typically land a force of more than 2,000 Marines along with their tanks, helicopters, fighter jets and supplies.